I would like all to meet my new pet which turned up at the front of my house after what felt like all day door knocking finding his home with no luck and a call to the animal shelter I have given it a home. It is a Budgie he is a boy and no name yet please I would like some ideas what to name him at the moment I whistle at him. But he has given me an idea what to crochet next. He's cute - congrats on your new pet. I don't have a suggestion for a name at the moment, but if I think of something I'll come back and leave another message. He's beautiful! 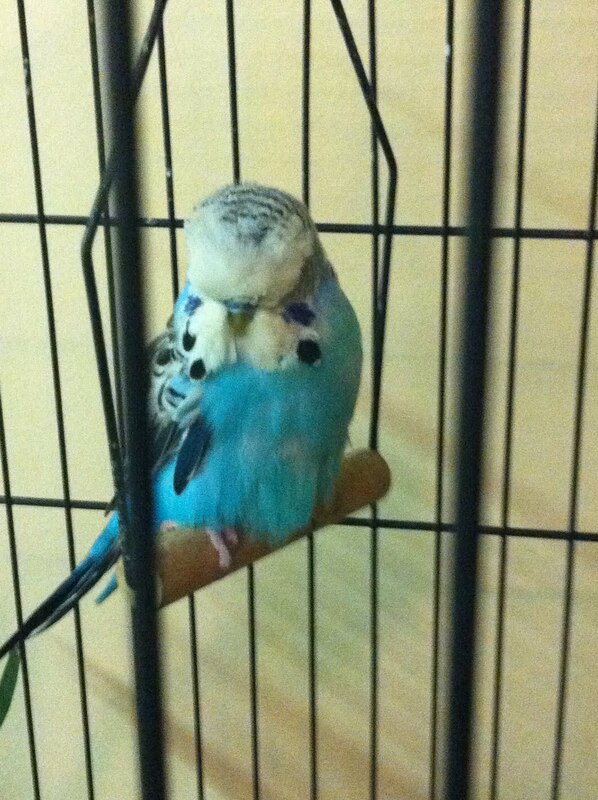 He's definitely a BBB - blue budgie boy. :o) I don't know about a name. Ralph? :o) You'll come up with something once you find out what kind of personality he has. Awww, love your budgie. How about Blue-y? Buster? Bubba? Look forward to seeing what you end up crocheting!